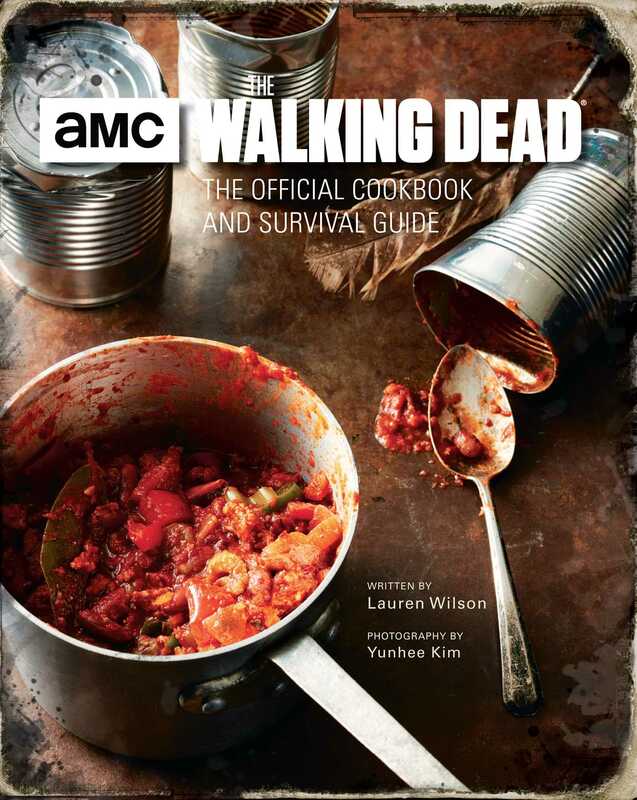 The Walking Dead: The Official Cookbook and Survival Guide by Lauren Wilson is finally here! If you’re worried about the end of the world, the zombie apocalypse, or want to try your hand at cooking like a pro, this cookbook is the perfect addition to your collection. But unlike those dieting books and complex Gordon Ramsey-esque recipes, AMC’s Cookbook and Survival Guide will be hit with the whole family and features recipes that are easy to follow but that will impress the toughest critics. 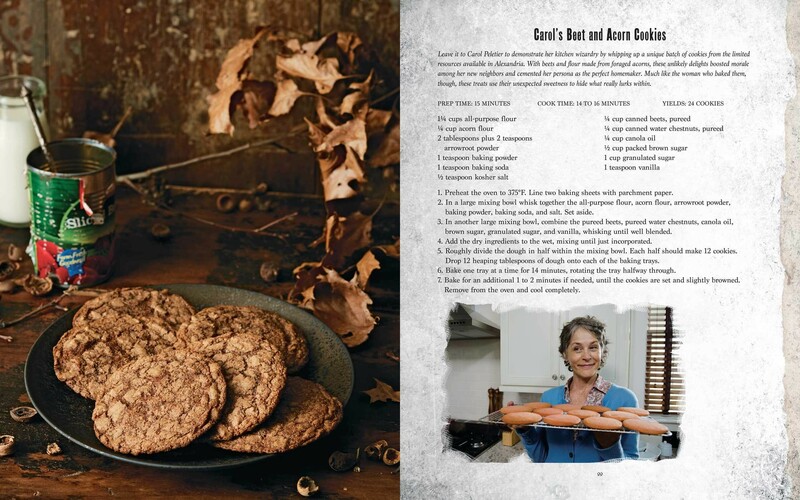 Lauren has taken iconic recipes from The Walking Dead like Carol’s Beet and Acorn Cookies and Carl’s Chocolate Pudding and breaks them down into the most likely ingredients for the apocalyptic time period and the final recipe outcome. She has also concocted other recipes that have come from suggestions in the show, like the Oceanside Fish Stew that assimilates what Tara might have eaten when she was fed by Natania in Oceanside. These brand-new recipes are accompanied by beautiful photographs by Yuhnee Kim. These recipes are, in many cases, composed of fewer than ten ingredients, and a fair few of the ingredients are from a can. The ingredients can be easily found in your local grocery store if you’re using this book before the Walkers take over or scavenged from bunkers and broken down cars if you procrastinate in buying it. Though, one thing that has weighed on my mind is the fact that one of the cobbler recipes – that would no doubt make Jerry happy – calls for heavy cream. Now, I’ve done a little research, and in the Georgia heat, your heavy cream is going to last for about 2 hours after the grid goes down – which is all the more reason to get this book before our power is wiped out completely. Most of the other recipes that need some kind of dairy make use of powdered milk, but only the best for King Ezekiel (He does have a tiger after all.). In addition to the (dessert and entree) cobblers and other sweet treats, Lauren has invented cocktail recipes that are sure to take the edge off of the end of the world and a plethora of entrees that take advantage of fresh ingredients and stored supplies. The book even includes instructions for making your own applesauce, preserves, jerky, and more that can be stored and saved for months. But in addition to being a resource for new recipes, this book is a survival guide. Lauren has done meticulous research to provide readers with an extensive list of survival hacks and tips – she even learned how to shoot a crossbow while researching for the book. The survival guide section, provides information that even Rick probably didn’t know before the world ended, like how to treat your water, the proper way to construct a fire, and how to make the most out of whatever power might remain in random batteries or make use of the the Alexandria Safe-Zone solar panels that provided some energy. Lauren also makes sure that before potential readers start making her recipes, they understand some basics about food preparation and preservation. Did you know that butter can come in a can? I didn’t, and Lauren’s recipes that call for butter would have been useless to me unless I found a cow somewhere that hadn’t turned into a Walker. If you don’t want to starve during the end times, copies of Lauren Wilson’s The Walking Dead: Official Cookbook and Survival Guide are available at the Atlanta Movie Tours shop, both in Castleberry Hill and online! And we are excited to announce that Lauren will be at the AMT shop October 20-24th to sign books and take her The Walking Dead cooking knowledge with us on select Big Zombie Tours. And on October 24th, Cooper Andrews (Jerry) will be joining our Big Zombie Tour 2; while he and Lauren are with us, you can ask them about their experiences with cobbler.